A patrol of parkland in 43 Division has created great community contacts as well as resulted in arrests. 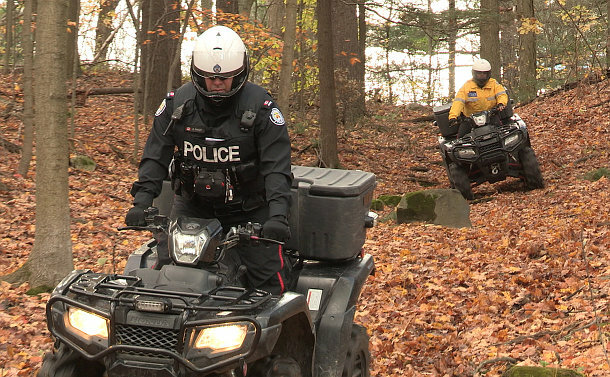 The officers have been using use All-Terrain Vehicles and bicycles to patrol parks, pathways, waterfront and playgrounds since July as part of the high visibility Project KOPS (Keep Our Parks Safe) initiative. The officers focus on ensuring that the parks are being used for recreation and not consumption of alcohol and drugs. Constable David Sawyer said officers have seized weapons, drugs and have made an arrest of a man wanted for attempted murder as they patrol the parks. They have also been employed on search and rescue calls for missing people.